The book presents invaluable insights and distills ideas, practices, failures, and successes into key principles that lean product development practitioners can easily implement. In 2005, Goodyear’s research and development (R&D) engine was not performing up to its full potential. The R&D organization developed high-quality tires, but the projects were not always successful. Goodyear embarked on a major initiative to transform its innovation creation processes by learning, understanding, and applying lean product development principles. Within five years, Goodyear saw its product development cycle times slashed by 70 percent, on-time delivery performance rise close to 100 percent, and throughput improve three-fold – all achieved with no increase in the R&D budget. 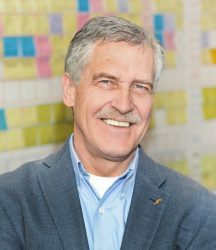 Beginning in 2005, Norbert Majerus has implemented a principles-based lean product development process at the three global innovation centers of The Goodyear Tire & Rubber Company, first in Akron, Ohio, and then in Colmar-Berg, Luxembourg, and Hanau, Germany. For nearly a decade, he has been Goodyear’s lean champion in research and development. Mr. Majerus, born and raised in Luxembourg, began his career at Goodyear in 1979 with responsibility for materials development, aircraft tires, and competitor benchmarking. In 1983, he moved to Akron to start a “short assignment” in innovative products, which continues to this day. During that time, he was a recipient of discretionary funding for a revolutionary new product and manufacturing process, and he earned more than 60 patents and trade secrets (patentable ideas that the company chose not to patent). Further assignments in Akron have included innovative processes; new tire development and project manager for North American, Asian, and European OEM customers; corporate benchmarking; design and test standards; activity-based R&D accounting; ISO/QS certification; and more. Majerus acquired a six sigma master black belt in 2003 and a lean master black belt in 2005. He holds a master’s degree in chemistry from the Universitaet des Saarlandes, Saarbruecken, Germany. Starting in January of this 2018, Norbert has “retired from Goodyear, but not from Lean”, and is working to share his knowledge and skills with other, newer adopters of Lean Product Development. Engineer author shares Goodyear success tale. 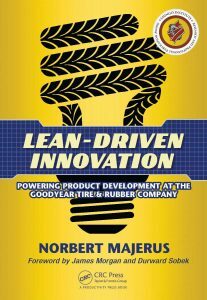 In writing “Lean-Driven Innovation: Powering Product Development at The Goodyear Tire & Rubber Company,” Norbert Majerus incorporates the voices of real people and highlights real events to provide a behind-the-curtain look at how Goodyear transformed its product development process, slashing cycle time by more than 70 percent and providing a three-fold increase in on-time delivery.